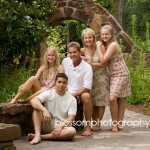 What a joy to work with this family! I photographed the girls when they were little and now they are all grown up. We had a really fun session – you’d never know by looking at the images that it was over 100 degrees. .